Sarah's Age Defying Secrets has leveraged its expertise to harness premuim powerful ingredients to tighten skin around the face eliminating under-eye bags, fine lines, eye, neck and chest wrinkles, crows feet, sagging skin, sun damage and pores to make your skin healthier and younger with renewed radiance quickly, safely, and effectively without the expense and pain of injections. 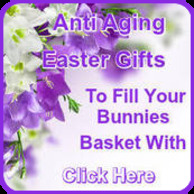 A complete line of anti aging skin products. Creams, lotions, serums and treatments to slow, reverse or halt signs of aging. Skin care products for the eyes, face, hands, and body. Look and feel years younger. Including Pearl Powder for radiant health, goddess beauty, and ageless skin. Anti-aging skin creams, antioxidants, skin and body firming, stretch marks, acne, and scars, powerful Matrixyl 3000, Argireline, Anti Aging Peptides, and Vitamin enriched serums and creams and anti wrinkle skin care. 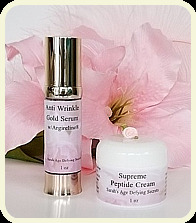 Anti wrinkle skin care specifically formulated to slow down aging and fight the wrinkle process. Our Luxury products are top quality and contain "star, key ingredients," ones that magically restores the beauty of your youth. Sarah's Skin Care Line, is a luxurious, innovative line with an exclusive selection of high-end, concentrated, active ingredients that put the power of youth at your fingertips at a price you can afford. Treats acne, rosacea & skin irritations. of scars caused by skin issues. a strong healthy body and longevity. Touted The New Anti-Aging Miracle. combinations designed for powerful results. skin’s natural cellular collagen activity.